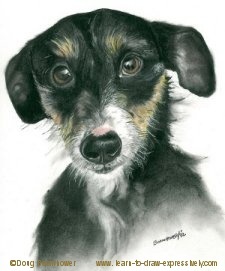 A pencil pet portrait can be just as “soulful” as a good portrait of a person. The most revealing characteristic of either a dog or a cat is the eyes. In animals, the mouth does not play as big a role as it does with people. However, a panting dog can express happiness, while a snarling dog always implies aggression. 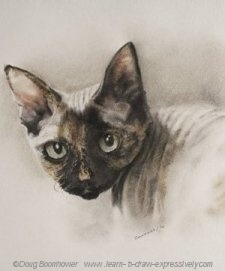 Once you’ve got the obvious shape of the animal, by preparing your preliminary pencil drawings, the main concern is the eyes. The above portraits were done predominantly with charcoal pencils, with some addition of pastels. White pastel chalk was also used in addition to the pastels, though in some cases you will notice that it is not white pastel, rather the natural white of the paper showing through as in the body and nose of the dog. 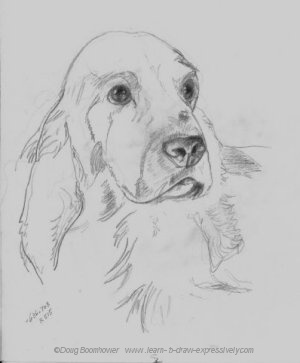 This is one of my preliminary pencil drawings of dogs. These drawings lay the foundation for the final composition. However, this preliminary drawing is strong enough to stand on its own. The eyes are the focal point. The rest of the drawing carefully supports them. Besides the eyes, this drawing starts to show the authenticity in the nose and the mouth area. Close observation is important. Try to see your subject the way their owner does. Dog and cat owners see their pets as extended family members. Owners attribute a personality to each of their pets. It’s that personality which you want to try to capture. Once again, the eyes are the key to that personality.